CellarPro's 1800H cooling unit (1/4 Ton Nominal) is the first cooling unit designed specifically for glass-enclosed wine cellars. Features include:. If the cooling unit is partially or fully exposed to an environment outside the cellar, especially if the cooling unit will be located in an unconditioned or warm, humid environment, we recommend insulating the left 13-inches of the cooling unit with 1-inch closed-cell foam insulation (R-4 or better). CellarPro 1800H Cooling Unit (P/N 25544). CellarPro engineered the 1800H cooling unit specifically for shallow-depth glass wine cellars. Just 10 1/2-inches deep and 10-inches tall, the 1800H Houdini cooling unit is designed to "disappear" inside - or atop - the cellar. Dual independent variable-speed fans offer flexibility to trade-off between super-quiet operation vs maximum performance. Before purchasing this unit, let us calculate the thermal load of your wine cellar. This unit can be configured to pull fresh air ranging from -20 to 95F. If the unit's location does not provide sufficient room for the unit's exhaust to dissipate and/or fresh air to be provided, you may need to purchase a rear duct kit. Fresh air intake below 40F will require the addition of a compressor heater, and fresh air intake below 20F also will require the addition of a fan cycling switch. The unit must be placed indoors in an area that is above 32F. Dual high-output fans come with independent variable speed settings for your choice of maximum cooling power at the high fan speed, or super-quiet operation (49 decibels) at the low fan speed. Custom coils generate maximum cooling power inside the cellar. Excess condensate is managed with a high-capacity stainless steel condensate pan and 100W electric heating element. With dual power sources and a 10-foot power cord, the unit can be plugged into a receptacle from either the rear or right side of the cooling unit, providing flexibility for most installations. Mounting brackets, included as standard equipment, ensure easy installation. ETL Tested and Certified to rigorous UL Standards for safety (PENDING). CellarPro 1800H cooling units are self-contained, fully-charged units designed to be attached to the ceiling inside the cellar, or above the cellar. 1800H units also can be located remotely from the cellar with the addition of one of our front duct packages. Offered with or without insulated flex ducting, in a choice of configurations for low or high humidity conditions, our front duct packages allow these cooling units to be ducted up to 50 equivalent feet away from the cellar and requires 6-inch (or greater) ducting from start to finish. 1800H cooling units require fresh air intake without interference from the unit's hot air exhaust. If sufficient space does not exist to provide fresh air, you may need our hot-side duct kit. If the fresh air intake (on the hot side) will pull air below below 40F, the cooling unit will require our Compressor Heater (P/N 1727) . If the fresh air intake (on the hot side) will pull air below 20F down to -20F, we recommend our Fan-Cycling Switch (P/N 6972) combined with our compressor heater. The cooling unit should never be exposed to temperatures below 32F. Duct Kits are the same as Duct Hoods, and also include 2 x 25-feet of 6-inch insulated (R-6) flex ducting. Condensate Drain Line: strongly recommended for wine cellar installations that are not airtight, a drain line allows excess moisture to drain from the the cooling unit (#1606). How do I pick between this unit and the 1800XTS? A: This cooling unit and the 1800XTS provide the same BTUH output, and therefore can be used to cool wine cellars with similar thermal loads. The biggest difference is that the 1800XTS was designed - and works best - when installed through-the wall, with the front 8 inches of the cooling unit inside the wine cellar. Also, the cold side of the 1800XTS cannot be ducted unless the cooling unit is located directly above the cellar. In contrast, the 1800H cooling unit was designed for shallow-depth installations, inside or atop the cellar. In addition, the 1800H can be placed up to 50 equivalent feet away from the wine cellar and ducted. Other differences include an advanced condensate management system in the 1800H, which has a large stainless steel drain pan and 100W condensate evaporator, as well as variable-speed fan control and removable power cord in the 1800H cooling unit. How cold can the temperature be where the cooling unit pulls air? 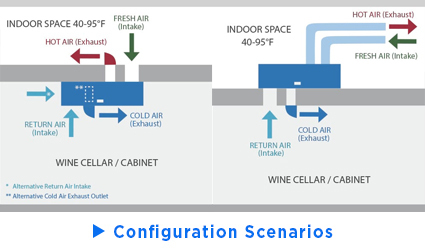 A: These cooling units can be installed completely inside the wine cellar, attached to the ceiling, with the hot air exhaust and fresh air intake pushed to and pulled from the space above the cellar. If I don't have sufficient space to pull fresh air, is that Ok? A: The hot side of the cooling unit generates hot air that must have sufficient space to dissipate, otherwise the unit will recycle its own hot air. The hot air exhaust and/or intake can be ducted to another location with our hot-side duct hoods and kits, which allow supply and return airflows to be redirected to and from a temperature controlled environment OUTSIDE the cellar. A: If you are using the cooling unit in an airtight cabinet or cellar, you probably don't need the drain line. To the extent that condensate is created, the 100W heating element inside the cooling unit reduces drainage as it helps to burns off condensate before it reaches the drain line. However, if your cabinet/cellar was built without a vapor barrier, or there are gaps where the door(s) closes against the cellar, you will need the drain line to allow excess condensate a path to be released to a designated location. Had my Houdini for over a year now and it works well. I have had to replace the unit recently since it stopped cooling. Probable cause is the hot side fan has burned out. Cellarpro sent a new unit and will refund the cost of that ($1000) on receipt of the old one. New unit works great but I hope it runs longer than 1 year. This cooling unit was installed in our 500 wine cabinet we had made. We love the cabinet, but the cooling unit is extremely loud. We have a large house and you can hear the unit when it is running anywhere in the house. Our contractor was joking it sounds like we live in a 7-11 with those large refrigerators. If you are thinking of purchasing, definitely look into finding a quieter unit if possible. I have the 1800XTS, but my experience with it tells me that this new model solves all the little naggy details I can think of for improving the otherwise excellent XTS model. Variable fan speeds, being able to duct both the hot and cold sides, and its less intrusive shape. You do need to look at what kind of intake / return configuration you need, how you will be routing the ducting, if in fact you need it, and may in fact find the XTS fits you better. Only negative I can think of is the fact that it is in fact brand new, so there bay be some design quirks that may need to get ironed out with the first year model of everything. I would recommend buying the enhanced warranty, and have better peace of mind.